The Intellislate allows you to navigate your computer while moving around the classroom. It communicates with the computer through an RF interface that plugs into any USB port on the computer. Its Intellislate multi-pairing function allows up to 50 units connected to one computer. 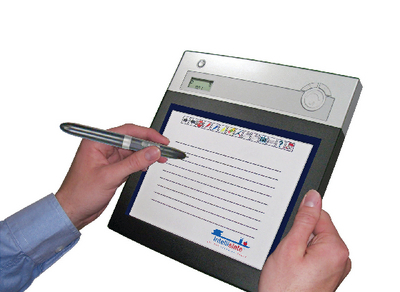 Unique Softkeys, located across the top of the tablet, allow instant access to various captivating Presentation Tools, such as Annotation Pens, Spotlight, and Reveal. The software also includes a library of clip art with over 2000 images. It utilizes high efficiency Lithium-Ion rechargeable battery (included) technology providing 16 hours of continuous use, and comes with charging cable that plugs into the computer’s USB port. Comes with one year warranty with registration. Weight: 1.5 lbs. Windows 2000, XP and VISTA or MAC OSX 10.4 Minimum.